If you need an appendectomy, he can do it with a stone scalpel he fashioned himself. If you have a condition nobody can diagnose--"creeping eruption" perhaps--he can identify what it is and treat it. A baby with hair tourniquet syndrome, a human leg that's washed ashore, a horse with Lyme disease, a narcoleptic falling face-first in the street, a hermit living underground--hardly anything is off-limits for Dr. Timothy J. Lepore. 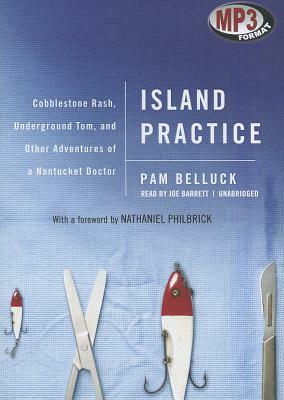 This is the spirited, true story of a colorful, contrarian doctor on the world-famous island of Nantucket. Thirty miles out to sea, in a strikingly offbeat place known for wealthy summer people but also home to independent-minded, idiosyncratic year-rounders, Lepore holds the life of the island, often quite literally, in his hands. He's surgeon, medical examiner, football team doctor, tick expert, unofficial psychologist, accidental homicide detective, and occasional veterinarian. When crisis strikes, he's deeply involved. Lepore has treated Jimmy Buffett, Chris Matthews, and various Kennedys, but he makes house calls for anyone and lets people pay him nothing--or anything: oatmeal-raisin cookies, a weather-beaten .44 Magnum, a picture of a Nepalese shaman. Lepore can be controversial and contradictory, espousing conservative views while performing abortions and giving patients marijuana cookies. He has unusual hobbies: he's a gun fanatic, roadkill collector, and concocter of pastimes like knitting dog-hair sweaters. Ultimately, Island Practice is about a doctor utterly essential to a community at a time when medicine is increasingly money driven and impersonal. Can he remain a maverick even as a health-care chain subsumes his hospital? Every community has--or, some would say, needs--a Doctor Lepore, and his island's drive to retain individuality in a cookie-cutter world is echoed across the country.